Industrial Ethernet patch cords shall be constructed of Category 6A, industrial grade, stranded, twisted pair cable for UTP and STP installations. Each patch cord shall be pre-terminated to include Category 6A industrial plugs on each end which are wired according to the T568B standard. 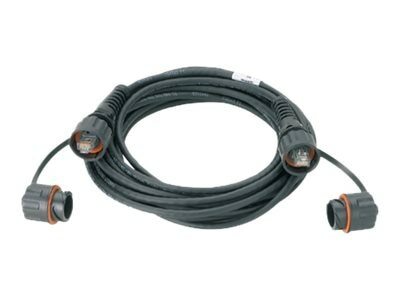 Patch cords shall include either industrial rated IP65/IP67 bulkhead connectors on both ends or an industrial rated IP65/IP67 bulkhead connector on one end with an IP20 rated RJ45 connector at the other end. Tethered caps shall be available on the bulkhead connectors to protect connectivity in un-mated conditions. An IP65/IP67 rating shall be achieved when mated with an IP65/IP67 and NEMA UL Type 12 industrial grade, bayonet style connector.